Toast is a DVD authoring software. "Toast is the best DVD authoring software for Mac!" I work at a church which requires weekly DVD authoring and duplication, and there's no better software than Toast to make authoring DVDs a snap! Software can be a bit buggy at times, and occasionally crashes while encoding. After the last update, it also seems to have trouble burning audio CDs from mp3s as well. 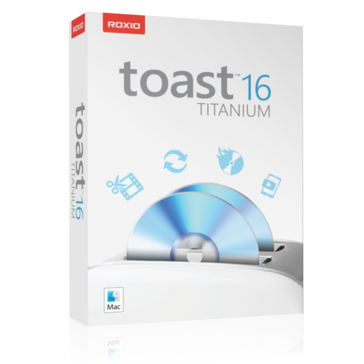 If you need DVD authoring software for Mac, you can't go wrong with Toast! Toast has allowed me to quickly author and produce master DVDs for duplication for our congregation. "Toast is a nice software to create DVDs. " Toast is a nice software to quickly create a DVD video with a basic menu for video files. The compression quality seems to be better than iDVD when trying to compress a lot of video time onto one single layer DVD. The menus are very basic when creating DVDs. There isn't much you can change when making the menu. It would be very nice if the user had more control of the menu creating process. I believe the newest version of Toast has better abilities for more options when creating menus for DVDs. I am hoping to try this version soon to be sure, but I believe Toast is getting a nice face lift for creating DVDs. I am able to burn basic DVDs of meetings for my work using the toast workflow. I can create these DVDs quickly even when the menus don't have many options. Roxio Toast is a fine middle of the road video rendering software. We used it primarily for DVD burning and it did the job. However, it left us wanting a little more in the actual construction of the DVD and formatting that is included with other software services. It seems very basic. If you need a basic DVD burner with a few bells and whistles, Toast does the job. But when trying to make complex DVD's for training purposes, we needed something more. Basic dvd burning. We used this to burn veteran interviews for the families to keep.